David Hunt Lighting British made Flemish 2 light wall fitting exhibits a timeless display of historical dutch artistry, packed with the distinctive and elegant style that has made this design so popular and long-standing. Completely hand-crafted and finished using traditional manufacturing techniques in Britian, this a truly unique and inspiring range. The product code for this David Hunt wall fitting is FLE0912. It features the quintessential baluster, with alternating wide and narrow parts, and the long, scooping arms that define a flemish chandelier. 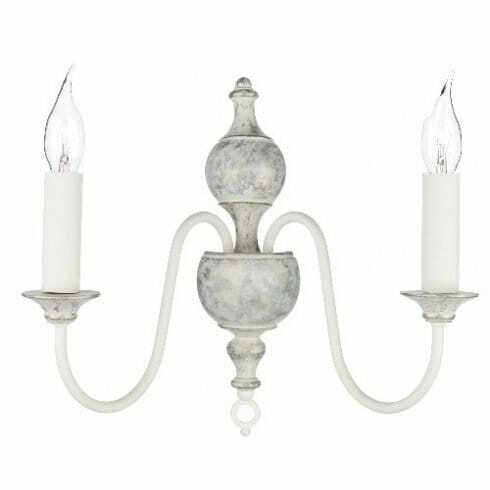 This central stem forms the wall plate to which the arms are attached, and are topped with traditional sconces and candleholders. The distressed powder grey finish with rubbed gold highlights completes the time-worn look and adds antiquated charm.